Longmire Administration Building, Mount Rainier NP, 1985. 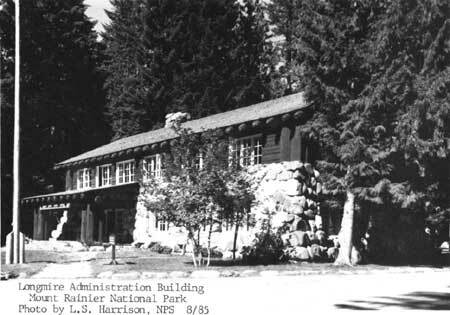 The three key buildings that create the outstanding architectural character of Longmire, the early development and administrative center of Mount Rainier National Park, are the former (third) administration building, the community building, and the service station. The design and siting of these three buildings has such a strong architectural intent that all of the other buildings in the vicinity recede into village fabric. The two largest structures--the administration building and the community building--were designed by staff of the National Park Service's Landscape Division under the direction of landscape architect Thomas Vint. Plans for the service station were prepared outside the park service but were reviewed by the Landscape Division in San Francisco prior to construction. The station's construction was overseen by the onsite park service landscape architect, Ernest A. Davidson. First of these buildings to be constructed was the Longmire community building, completed in 1927. The building has changed little since construction. Generally T-shaped in plan the building has a concrete foundation finished with a stone veneer and a wood-frame superstructure. The wood-frame walls of the main wing are finished with a thick log-slab veneer on the interior and exterior. The front elevation, divided into four bays, has an entrance porch in the third bay. The corners of this wing and the bay divisions are articulated by pairs of peeled log posts, giving the building the appearance of massive timber framing. Small portions of the lower sections of these logs have rotted and have been replace with circular (non-historic) concrete pads. The walls of the rear wing are finished with board-and-batten siding. The intersecting gable roofs are steeply pitched and finished with wood shingles. Most of the windows in the structure are paired, multi-light casements with transoms above. The paired casements on the front elevation are clustered in groups of two and three. The multi-light French doors at the front entrance are flanked by additional casements. The most important interior space is the community room. The room, little changed since construction, has an impressive exposed roof structure. The scissors truss, rafters, and purlins are all peeled logs that support a decking of cedar tongue-and-groove boards. Original wrought-iron chandeliers and sconces light the interior. One gable-end wall contains the massive stone fireplace and chimney. Stones in the lowest portion are coursed, roughly squared stones, while those of the upper portion, including the central niche in the chimney, are glacial boulders. The opposite gable end contains a small stage set in a projecting bay. Three massive wood tables of rustic design remain in the community room. These are similar in design to some in the lobby of Paradise Inn, a few miles away. Spotlights, speakers, and small fans have been added in this room with no visible damage to the historic fabric. Original wood floors throughout the structure are covered with linoleum. The rear of the structure comprises the base of the "T." The first floor of the rear wing contains a kitchen area and restrooms. The upstairs contains two apartments, both remodelled in 1964. This rear wing contains little historic fabric of note, due to remodelling efforts through the years. Only the exterior of this wing is included in this nomination. The most architecturally important structure at Longmire is the administration building. The building's foundation, first-story, and second-story walls up to sill height are composed of glacial boulders bonded with cement mortar. The stone walls of the first story are battered, and the smooth, rounded glacial boulders soften the building's edges even further. The largest boulders are in the lower wall sections. The second story above window sill height has the appearance log and timber framing, although the fabric actually is wood framing covered with log-slab siding. Three logs edge the corners of the upper portion and serve as corner posts. They also continue the visual pattern established by the logs of the entrance porch. The gable roof is finished with wood shingles. The main entrance into the building is through a porch constructed of massive logs with a shingle-covered shed roof. Corners of the porch have small planted islands made of glacial boulders and filled with low, native shrubs. The walkway up to the building and the porch floor are flagstone. The entrance consists of French doors flanked by paired casements. Casement windows throughout the rest of the structure are clustered in groups of two, three, and four. Windows and doors on the first floor are capped with huge log lintels. Axe-cut rafter tails and bracketed outlookers project out beyond the roof from the eaves and gable ends respectively. The rear entrance to the building is sheltered by a large porch. A concrete ramp provides wheelchair access into the structure. The rear entrance door is wood with heavy log slabs on the exterior. A small grotto outlined by massive boulders and containing a plaque commemorating Stephen T. Mather, first director of the National Park Service, is adjacent to the building and included within the boundaries of this nomination. The room configuration on the interior has undergone a few slight changes, but basically remains intact. The main lobby area is a handsomely executed space and now contains the visitor contact desk. The highlight of the room is the fireplace constructed of oversized, smooth glacial boulders. Largest of the fireplace stones is the elongated mantle stone that spans the opening. Hanging above the mantle are crossed snowshoes, and ice-axe, and other glacial climbing equipment added in 1980 and not considered part of this nomination. The hardwood floors of this space are finished with a polyurethane varnish and covered with carpet in the high-traffic areas. Walls are log-slab siding laid horizontal, with a low wainscot of horizontal slabs. All the doors and windows in this room are surrounded by massive moldings of log slabs. The ceiling is not original and consists of sheetrock with a rough plaster finish. Recessed spotlights in this new ceiling augment the original wrought-iron chandeliers hanging from the ceiling. The new ceiling treatment and the spotlighting are not included in this nomination. The visitor-information desk is sheathed with log slabs, adding to the room's rustic character. A fluted bronze drinking fountain sits in one corner of the room. Other rooms on the first floor are offices and storage space. The second-story spaces include a large conference room and additional offices. The basement contains mechanical equipment, storage spaces, and a jail cell. Original hardware appears on the doors and windows throughout the building. Most of the doors and windows are original. Modern partitions and cosmetic changes such as carpeting, fluorescent lighting, and paint finishes are not included in this nomination. The last building of this group is the small service station (1929) adjacent to the National Park Inn. The first floor of this building up to sill height is of stone and concrete construction. The wood frame above is sheathed with log siding. The first floor of this building houses a small office for the service station. The roof stretches out to the gas-pump island providing shelter for one lane of the drive-through. The upper story of the building contains a small apartment under its steep gable roof. Access to the apartment is by way of an exterior staircase and door at the rear of the building. The gable roof is finished with wood shingles. The eave at the gable end has axe-cut bracketed outlookers adding to the building's rustic character. Windows on the first floor are multi-light casements. A single square casement appears in the gable end on the front elevation. The building has log corner posts at its corners that match the size of the log posts supporting the roof over the gas pumps. Lower portions of the island are of glacial boulders and concrete. These three buildings--the community building, the administration building, and the service station--create the rustic image of Longmire and Mount Rainier National Park. During the early days of national parks no set theories of architecture appropriate to the awesome natural settings existed. The railroads, responsible for the early large developments in many park areas, experimented with several types of architectural design. Some railroad-constructed buildings closely followed European precedents, such as the chalets at Glacier National Park. In other instances they experimented with offshoots of indigenous American buildings, such as the pueblo replication of Hopi House at Grand Canyon. In a third and infrequently used type the railroad architects let the natural materials of the surrounding landscape dictate building forms--such as Lookout Studio at Grand Canyon. After the National Park Service was established in 1916 the federal experiments in compatible architecture began following all of those stylistic possibilities, but putting most emphasis on the third approach. These buildings at Longmire are among the most successful experiments in the development of that rustic design ethic. while possessing great architectural integrity. At the time these buildings were constructed the Landscape Division of the National Park Service, headed up by landscape architect Thomas Vint, had just assembled a group of highly creative young men willing to seek out those design elements which made the buildings required for park development as harmonious as possible with their park settings. Vint's team of architects and landscape architects experimented with materials such as stone and logs, and with ways of shaping those materials into structures that "belonged" in the often scenic natural surroundings. The designers and onsite construction supervisors carefully studied the natural materials in the surroundings landscape--their scale, color, massing, and texture--and incorporated what they could into their designs. At Longmire an obvious building material was the rounded glacial boulder, smoothed by glacial action to a point where a matte sheen appeared on the rock. The architects and landscape architects often chose each stone and ensured that the masons created a soft, rounded batter to the walls of the administration building. The trees of the surrounding forests had thick trunks; the designers incorporated those trunks in the log framing and corner posts of the buildings. The overall result at Longmire was a group of structures that harmonized with the moraine landscape on the floodplain below the rugged slopes of Mount Rainier. The buildings acknowledged and emphasized the beauty of the landscape through use of native materials such as boulders and logs in a scale larger than those found in most building construction, but equivalent to the scale of those elements found in the buildings' immediate surroundings. The three key buildings at Longmire were constructed under the able supervision of landscape architect Ernest A. Davidson, assigned to Mount Rainier National Park out of the park service's Landscape Division in San Francisco. Davidson's forte was fieldwork, particularly the onsite design of roadways and bridges. Although he did not have a degree in landscape architecture, he had taken courses in the subject at Washington State College at Pullman from a professor trained at the University of California in Berkeley. Immediately before joining the park service Davidson was a bank cashier. His drafting was excellent, so Thomas Vint, the chief landscape architect of the service hired him. Under Vint's guidance and through years of fieldwork Davidson became one of the best landscape architects in the Landscape Division, later known as the Branch of Plans and Design. Davidson was also designer and construction supervisor on the Yakima Park stockade development on the east side of the park. Longmire's administration building retains considerably more architectural integrity in terms of fabric than does the Yosemite administration building, but more importantly retains its approach vista. After driving along the entrance road through the thick, northwest forest, the visitor comes to Longmire, an open area on a slight grade. At the upper end of the open area, the administration building commands attention against a background of tall fir, cedar, and spruce. The approach vista lines up directly with the administration building; the road veers to the left past the building continuing up and around the mountain's flank. This vista of the administration building presents the rustic, yet slightly formal image the park service designers strove to create. The community building and the service station reinforce that frontier, forested image. The service station, on the right side of the approach road before the administration building, is so well designed and sited back in the trees that it is barely noticeable. Even its function does not seem incongruous with the rugged setting. The community building next to the old campground is again overshadowed by the towering trees around it. It, too, is in harmony with its setting. Both the administration building and the community building were featured in the 1938 publication Park and Recreation Structures--a three-volume compendium of "successful natural park structures" designed in a variety of styles and with a variety of materials. All of the structures presented were designed to modify the landscape as little as possible and to "appear to belong to and be part of their settings." The three volumes showed the best efforts and most successful experiments of Vint's Landscape Division and the later Branch of Plans and Design. These structures--particularly the early ones such as these Longmire buildings--served as the basis of most of the design done during the work relief programs of the 1930s. The Longmire buildings are among the few in the nation retaining high levels of architectural integrity. The Longmire service station is of regional architectural significance as one of a diminishing category of gas stations of rustic design. During the 1920s and 1930s service-station architects took considerable creative license in designing their buildings. Most often the architects selected styles befitting the surrounding architectural environment. Chinatown in San Francisco received a pagoda-styled station. Suburban areas were graced with stations recalling the quaint, picturesque design of English cottages. Some urban areas in the northeast and mid-Atlantic areas had gas stations with colonial designs resembling miniature Mount Vernons. Longmire, bordering the edge of the wilderness, received a rustic station of glacial boulders and peeled logs. The building retains considerable integrity. 1 The author has travelled extensively throughout the western United States over the past twelve years and has seen only a handful of service stations of rustic design. Some occur in areas administered by the U.S. Forest Service, such as the rustic station at Union, Oregon just south of Crater Lake National Park. Others occur in mountain resort areas. Most of the rustic stations have been altered, some beyond recognition, to accommodate larger vehicles or new equipment. Please note that the author's survey of rustic gas stations has been quite informal and cursory. 2 Considerable changes to the interior and exterior of the Yosemite administration building have substantially altered its integrity. The author considered that structure in this study but judged it not to be of national significance because of those changes. The boundaries of these three buildings are non-contiguous. The boundary line for the old administration building is 25 feet out from the walls of the building, and runs parallel to those walls. The boundary line for the service station is 15 feet from the walls of the building nd runs parallel to all those walls. The boundary line for the community building is 25 feet from the walls and runs parallel to all of those walls.